My two boys, Age 5 and Age 2, goes to nursery school every weekday. As of this, I have to prepare nursery school goods for them every single day, and finally I found my beautiful solution! Preparing every goods at once on the weekend! First, gather the stuff like T-shirts, pants, towels from closets. Second, make them into five 5 bundles for each kid. At last, wrap them with rubber bands, put cups and toothbrushes into small bags. This will help you a lot on weekday mornings and I’m sure you will appreciate to yourself!!! After I decided to do this, I bought extra clothes so that I can prepare at once. 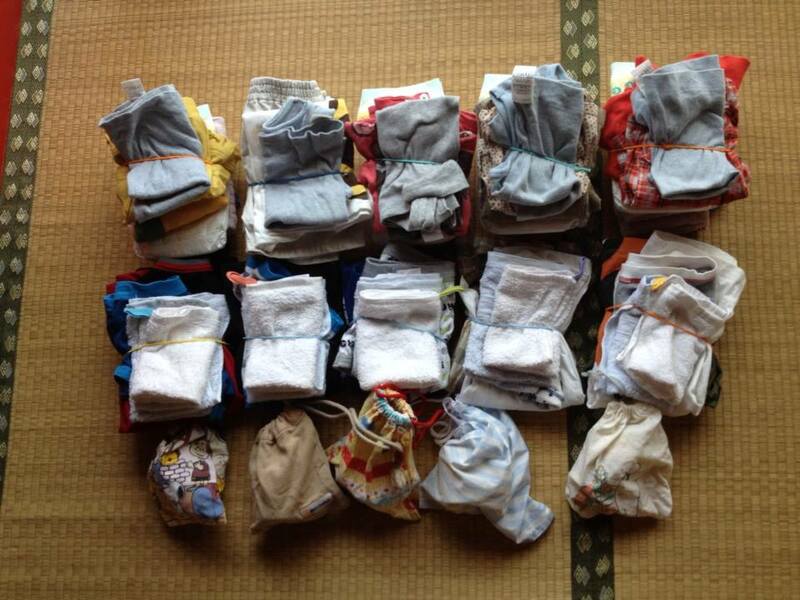 In the Photograph above, you see 5 bundles for 2 years old Haru and another 5 bundles for 5 years old Taka and 5 small bags for Taka. I hope this will make your busy morning happier! This entry was posted in 01_Working Parents, 03_First Son (Taka), 04_Second Son (Haru) on 2015/03/06 by mangadiary.